Identify the integrated nature of green and sustainable landscape design as outlined in the new SITES v2 Rating System. Assess design options for using permeable paving products that contribute to sustainable site design. Describe how geomembranes work in the design of stormwater management and water retention ponds. Explain how thermally modified wood products can positively contribute to both design enhancements and environmental quality. Review sustainable products and materials that are beneficial to landscape architectural design as well as human health and environmental quality. 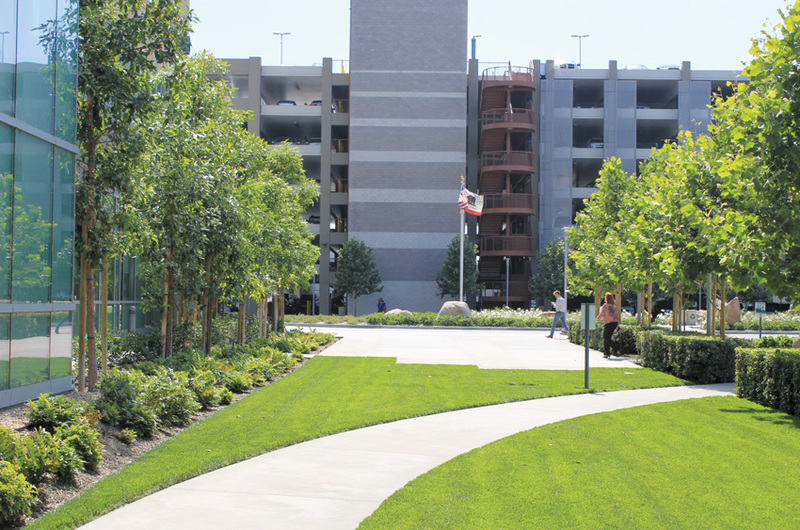 Photo courtesy of Soil Retention Products, Inc.
Landscape architectural elements are integrated to provide maximum environmental benefits at Kaiser Permanente Hospital. SITES is a comprehensive rating system administered by Green Business Certification Inc. (GBCI). It was developed as a result of the LEED rating system, which focuses on building construction and provides a limited number of guidelines directed toward measuring the sustainability of sites and the value of landscapes. The SITES draft guidelines and performance benchmarks were developed in 2007. The Guidelines and Performance Benchmarks (SITES version 1) were released in 2009. The rating system was then field tested through a two-year pilot program involving more than 160 projects. The information gained from the participating pilot projects was used to develop the SITES v2 Rating System. SITES criteria support the unique conditions of each project site and provide flexibility for project design teams so that they can achieve a SITES-certified project. SITES-certified projects positively address issues of stormwater runoff, wildlife habitat, energy consumption, air quality, carbon storage, and human health and well-being. As of 2015, design professionals are now able to obtain SITES certification for projects through the SITES v2 Rating System. SITES has adapted LEED credits as part of its SITES v2 Rating System, when relevant and appropriate. GBCI provides project certification to the requirements of the SITES v2 Rating System. Also, the U.S. Green Building Council (USGBC) has adapted certain SITES credit content into the LEED green building rating criteria. The basis for the SITES v2 Rating System is ecosystem services. The services provided by healthy ecosystems include regulation and moderation of weather and climate change by vegetation, promotion of varied plant and crop growth by pollinator species, purification of stormwater by vegetation and soil ecosystems, and the uptake and storage of carbon by plants. These ecosystem services occur at a variety of scales and habitats. However, these ecosystem services are difficult to measure and monetize, and consequently the design elements that positively support them are typically ignored or value engineered out of a project’s design. The SITES v2 Rating System provides a series of performance measures that focus on an understanding of natural processes, best practices in landscape architecture, ecological restoration, and human health and well-being. By achieving SITES benchmarks, a project will contribute to maintaining, supporting, and enhancing natural systems and the ecosystem services that they provide. Firestone Building Products GeoGard EPDM Geomembrane is the durable, dependable solution for nearly any application. Whether for decorative commercial water features or agriculture, aquaculture, mining, and other water-containment applications, it is easy to install and built to last. Drivable Grass® is a permeable, flexible, and plantable concrete pavement system that is environmentally friendly and a beautiful alternative to poured concrete and asphalt. Drivable Grass offers strength, permeability, flexibility, and many design opportunities due to various infill options, such as grass, artificial grass, decomposed granite, and ground covers. Our wood planters are produced from Boulevard thermally modified wood, which goes through a process that changes the chemical makeup and cell structure of the wood, providing exceptional resistance to rot, pest, decay, and warping. Technically, it shares a 25-year preserved-wood-like durability level similar to South American hardwoods yet is ecologically friendly.